The SP_TransactionNotification is to receive notification on any transaction – in other words to do some validation in SAP Business One and prevent the user from doing an action if the validation condition fails. This stored procedure(SP) is created automatically with each database.This stored procedure is fired whenever operations are performed on business objects like document or master records and User-Defined Objects. The SBO_SP_TransactionNotification stored procedure is created automatically when new company is created in SAP Business One. @list_of_cols_val_tab_del This returns a tab-delimited list of values required to retrieve the object from B1. please make sure you always go through the “@error, @error_message” at the end, especially in the case where you want the transaction to be considered as successful. Without the return of these 2 values, SAP Business One will consider the transaction as failed. Only the query needs to be change according to your need. Comment within SQL statements do not affect the statement execution. You can comment statement in to ways. The only differences being when they are triggered and the ability to use the @error functionality of SBO_SP_TransactionNotification to rollback transactions. SBO_SP_PostTransactionNotice can only be triggered at the end of an action (transaction committed). Most users only use SP_TransactionNotification because it can be used to verify data to block unwanted posting. 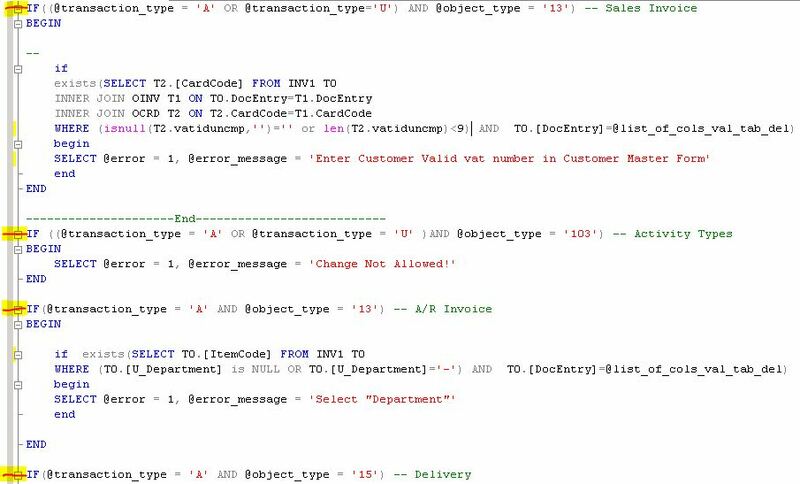 sap hana sql script – YouTube.. I want to many SBO_TransactionNotification in sap b1. Can you explain me how to create many SBO_TransactionNotification at once time ? SP_Transaction would be only one, you can insert your SQL code for many documents with proper syntax and terminators . On your request updating this blog with multiple Notifications on single SP_transaction. I tried the below code for making TaxCode field mandatory in Purchase Order. I add it SBO_SP_TransactionNotification but it cannot affect…plz give me solution……….. Thank you…I’ll try and get back to you..
Its very late for reply….I applied your code and it works properly….Thank you for that. Previous code is work at final add i.e PO goes to approval and it get approved and when we finally add it to system it block it…but i want it block before sending to approval….